IMAGE: A still from a Houston Police Department video showing a device which helps enforce the passing distance law. Transport Minister Shane Ross seems set not to keep his promise to legislate a minimum passing distance of motorists overtaking cyclists as there are fears that an exact distance would not hold up in court. 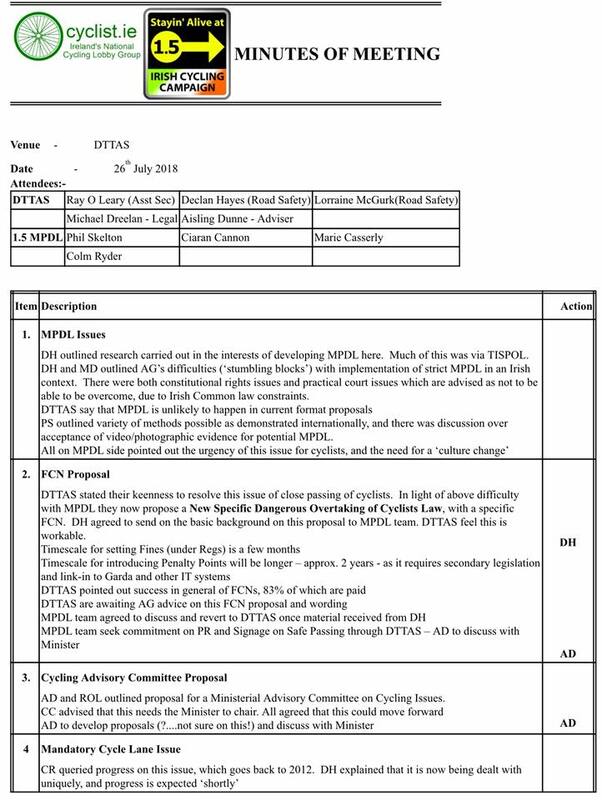 IrishCycle.com understands that the Attorney General’s office has concerns over a measuring device used by police, while the Department of Transport were not open to the use of video footage for prosecutions. “There were both constitutional rights issues and practical court issues which are advised as not to be able to be overcome, due to Irish Common law constraints. DTTAS [the Department of Transport] say that Minimum Passing Distance Law is unlikely to happen in current format proposals,” he said. He said that as a compromise the Department of Transport is now propose a new specific dangerous overtaking of cyclists law, with larger penalty. He said he was always keen on the passing distance law “not becoming a paper tiger” and so he feels the proposals by the department need to be examined. Skelton said that the West Midlands Police — which is highly active on social media — enforce safe passing without a specified distance in UK law and this “could be a viable model” for Ireland. Let’s get on with detecting and enforcing the existing ‘dangerous overtaking’ regulation in SI No. 182 of 1997 (s. 10). That doesn’t have any Constitutional barrier or whatever impediment the authorities wish to promulgate. Oh! I forgot, it actually requires members of the force to be out and about doing traffic surveillance. If they don’t know how to do it then head to England and see how others do it. Meanwhile our fearless min for transport’s latest populist wheeze is to propose grants for grannies for child minding,could someone tell him what the dept of transport is supposed to do.